Compact A4 colour MFPs to increase your productivity. Ricoh MPC 401sp. Top performance, outstanding reliability, high productivity ... and exceptional value for money. 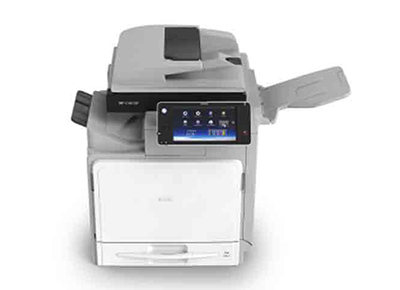 That’s what you get with the MP C401SP/MP C401SRSP/MP C401ZSP/MP C401ZSRSP, Ricoh’s compact A4 colour multifunctionals. But that’s not all. You also get consistently high quality results, superior image quality and efficient finishing capabilities. Plus simple, intuitive operation, a low environmental impact, and a choice of four configurations. The MP C401SP/MP C401SRSP/MP C401ZSP/MP C401ZSRSP are therefore the obvious choice for offices where productivity, workflow, quality and cost-efficiency are high on the priority list.